← Turkish and international academics: We will not be a party to this crime! Note from the LeftEast editors: In this video of European Alternatives’ ‘TalkReal’ series the debate is on how to go beyond the pessimism that has taken over our contemporary political climate. 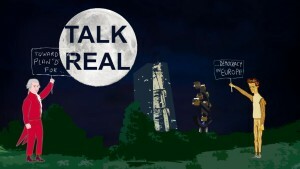 TalkReal is published in co-operation with OpenDemocracy and Roarmag. For years we have been told ‘There is No Alternative’, that the status quo is both healthy and here to stay. But as neoliberal institutions struggle to contain a complex and multi-headed crisis it is clearer than ever that radical change represents our only chance of a better future. In this episode of TalkReal from the end of 2015 European Alternatives’ Lorenzo Marsilli debates with Walter Baier (Coordinator of Transform), Katerina Anastasiou (Change4All), Kurto Wendt (Convoy Refugee) and Alexandra Strickner (ATTAC Austria) about how to go beyond the pessimism that has taken over our contemporary political climate. At the core of this question remains the demand for real democracy – the same issue that fuelled many of the 2011 movements. While these national initiatives were limited in scale and outcome, they did galvanise the imagination of civil society and, more importantly, demonstrated its capacity to organise outside of incumbent institutions. Today, as right-wing populisms leech on peoples’ fear, such experiments should not be seen as a failure but as blueprints for an alternative: a coordinated and international demand for democracy. How come that this video is published here without a comment regarding its in my view extreme Western bias. The purpose of this website is “The LeftEast section of CriticAtac is a place where various voices, efforts and groups from around the region broadly understood come together in a sustained analytical and political effort. This is a platform where our common struggles and political commitments come together” No such thing is addressed in the video. On the contrary is Eastern Europe addressed in terms of a threat with nationalism in Hungary and Poland as an example or what can be seen as more paternalistic as a place were Westerners tries to organize TTIP protests. Especially problematic is the idea that the refugee crisis and authoritarian neoliberal politics we see in Europe today is addressed as if the only solution is to make EU more democratic. I can agree with much of the arguments for making EU more democratic but totally disagree with the lack of interest for European refugee crisis and neoliberal authoritarianism were it is expressed in maybe its most extreme forms, in Ukraine. The idea that nationalism by definition in right wing seems too easily develop into total ignorance for the Europe outside EU which be definition cannot be included in the ideal of making EU more democratic. Furthermore that interesting examples of successful antineoliberal struggle like the Icelandic refusal to accept evacuating people ho have become bankrupt from their homes or sending banksters to prison or the peasant road blockades all over Ukraine against IMF/EU policies under blue and yellow banners and nor Right Sector in sight are on the other side of the horizon. There is something missing in this dream of unifying everyone behind a least common denominator or human rights, environmental protection, open borders etc. falsely called a democratic Europe and in fact a more democratic EU. It present itself as opposing all forms of right or left nationalism claiming EU as the central place for the struggle for democracy. As if a simultaneous international struggle whether as a struggle at the national level without seeing a more united EU as the end result, or at the EU level or outside EU uniting rural and urban class struggle in Russia, Ukrane, Iceland and all the rest of Europe and hopefully other places on earth. I have seen on Political Critique website for Visegrad countries a similar sort of hope for Eastern European thinking to solve the problems of CEE countries dreaming of yet another Southern and Western European lofty dream of democritizing EU as the advanced answer to the present multiissue struggle, always leaving Eastern Europe to a subaltern role at least outside small circles of Brussels funded projects. As a Swedish environmental activists I find this Western bias as a bit tragical. Instead of looking at the affluent West with its well funded organisations one should more look at were the material conflicts are deeper and can cause other equally important or even more important changes than those dreamt of in the west. But than Eastern Europe have to stop dream as a junior partner of the West. As a Sweden I prefer to dream more with Saving Iceland and other environmentalists as well as Wikileaks activists that struggle in the Icelandic nation as well as internationally rather than the more and more backward thinking in Western and Southern Europe at least when they repeat the old mantra about EU instead of simultaneous struggle in many places inside or outside EU as the foremost democratic struggle.